Economic prosperity requires a game plan for sustaining the triple bottom line - people, planet and profit. That means organizations need leaders who are competent in navigating the sustainability landscape. Mark is at the forefront of the sustainability leadership movement as an emerging business practice, recognized for authoring the book Global Sustainability and understanding how to turn "concepts" into "profits." As an organization's demands rise, workplace tension is inevitable. As a result, emotions may drive decisions. The process of conflict management aims to diagnose issues, resolve differences through respectful learning in an open communication environment, and emphasize positive aspects of conflict to improve group outcomes. Advance your C-suite executive skills for continued success in business. New trends and technologies are completely transforming our business and personal environment, making the task of true leadership harder. Explore fresh ways to deal with the new business reality and embrace the personal changes necessary to lead with confidence. A retreat needs to have a concrete payoff, a business result. It's not about "trust falls." When planning an event, one of your most important decisions will be selecting a facilitator to assist you with the entire retreat. The Lefko Group provides quantifiable resources to explore and define the full value of a team. Focusing on next steps for continued meaning and fulfillment in life. You are in your late 50’s, 60’s or 70’s and have had (and may still be having) a successful business career. Up until now, business has been your primary focus. Getting older, you're beginning to think about next steps in life and staying relevant. Smart leaders have a sustainability strategy. 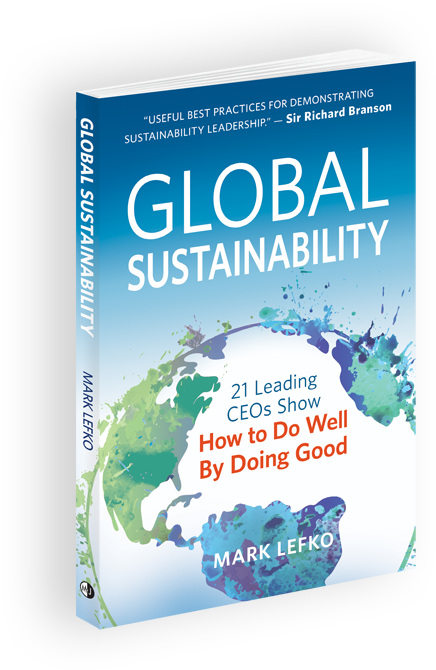 Featuring in-depth interviews of 21 leading CEOs, Mark Lefko’s book examines the subject of sustainability from the perspective of today’s most influential business executives.